If planting from acorns, check their viability. Remove the caps and put the acorns in a bucket of water. 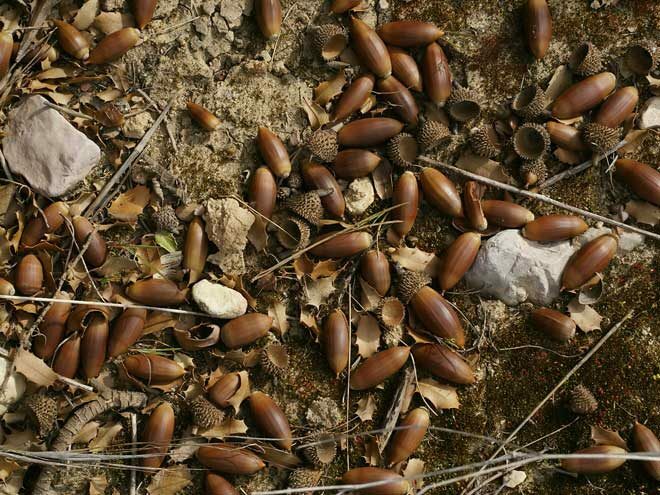 Damaged or dried-out acorns will float and should be discarded. “Sinkers” can be planted immediately or refrigerated for planting later. First, soak them for 30 seconds in a 1 percent bleach solution to kill any pathogens, and then rinse thoroughly. Plant acorns one-half to one inch below the soil surface, preferably after digging a deeper hole that is partially refilled with loose soil before adding the acorn, cap end up. If the acorn has germinated and a root tip is showing, it is best to plant it immediately. (The root will grow quickly even in cold storage.) Don’t damage or break off the root tip. Acorns also can be started in one-gallon pots but prepare to plant the seedlings within a year because the tap root will quickly outgrow the pot. Keep the planting area weed-free, and deep-water at least once a month. Hot weather will necessitate more frequent watering.